200,000 6 per cent. Preference Shares of £1 each, and 480,000 Ordinary Shares of £1 each fully paid. ISSUE of 85,405 PREFERENCE SHARES, being balance of authorised Preference Capital at par. Form of Application for Preference Shares. 14, Dowgate Hill, London, E.C. 4. Having paid to your Bankers the sum of £___ , being a deposit of 5s. 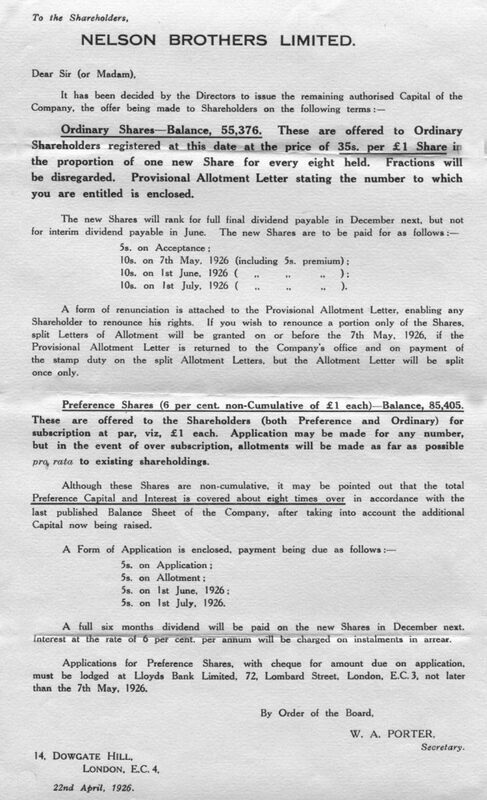 per share on application for ___ Preference Shares of £1 each of the above issue, I/we request you to allot to me/us that or any lesser number of Preference Shares, and I/we agree to accept the same in accordance with the terms of the Company’s Circular Letter of the 22nd April, 1926, and of the Memorandum and Articles of Association of the Company, and I/we undertake to pay the balance by the instalments specified in the said Circular Letter, and I/we authorise you to place my/our name(s) on the Register of Members of the Company in respect of the Preference Shares allotted to me/us. In case of Joint Accounts, each holder must sign. This Form must be filled up and sent with a Remittance to Lloyds Bank Limited, 72, Lombard Street, London, E.C.3. Cheques must be made payable to “ Bearer ” and crossed. If altered from ” Order ” to “ Bearer,” the alteration should be signed by the Drawer. An acknowledgment will be forwarded in due course by Allotment Letter. Ordinary Shares – Balance, 55,376. These are offered to Ordinary Shareholders registered at this date at the price of 35s. per £1 Share in the proportion of one new Share for every eight held. Fractions will be disregarded. Provisional Allotment Letter stating the number to which you are entitled is enclosed. 10s. on 1st July, I926 (including 5s. premium). A form of renunciation is attached to the Provisional Allotment Letter, enabling any Shareholder to renounce his rights. 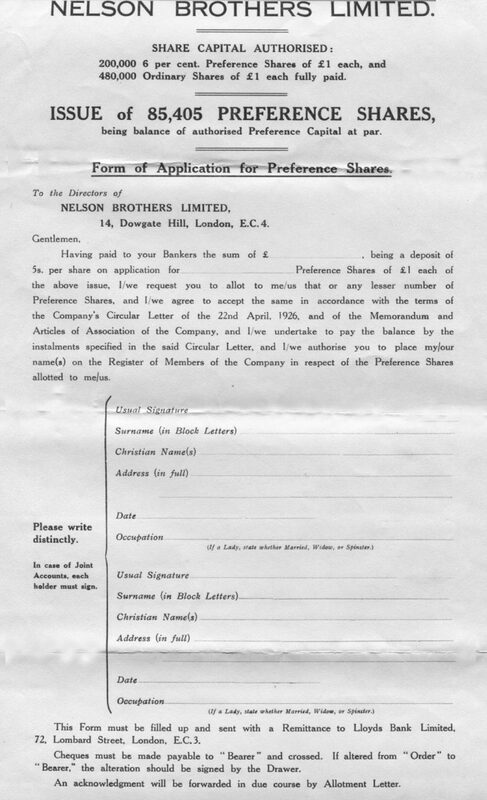 If you wish to renounce a portion only of the Shares, split Letters of Allotment will be granted on or before the 7th May, 1926, if the Provisional Allotment Letter is returned to the Company’s office and on payment of the stamp duty on the split Allotment Letters, but the Allotment Letter will be split once only. Preference Shares (6 per cent. non-Cumulative of £1 each) – Balance 85,405. These are offered to the Shareholders (both Preference and Ordinary) for subscription at par, viz, £1 each. Application may be made for any number, but in the event of over subscription, allotments will be made as far as possible pro rata to existing shareholdings. Although these Shares are non-cumulative, it may be pointed out that the total Preference Capital and Interest is covered about eight times over in accordance with the last published Balance Sheet of the Company, after taking into account the additional Capital now being raised. 5s. on 1st July, 1926. A full six months dividend will be paid on the new Shares in December next. Interest at the rate of 6 per cent. per annum will be charged on instalments in arrear. Applications for Preference Shares, with cheque for amount due on application, must be lodged at Lloyds Bank Limited, 72, Lombard Street, London, EC. 3. not later than the 7th May, 1926.